From the DVDs shown last week, you learned these lessons (I hope!). A star (Sun is just an example) is a ball of mostly hydrogen and helium gas. A star starts out as a large cloud of gas and dust that is concentrated by gravity. As gravity pulls stuff together, it also heats the gas, creating a glowing body called a protostar. Once the center of the collapsing gas cloud (protostar) reaches a temperature of a few million K, nuclear fusion starts. This process fuses hydrogen into helium and releases an enormous amount of energy. This energy provides pressure to "fight" gravity. 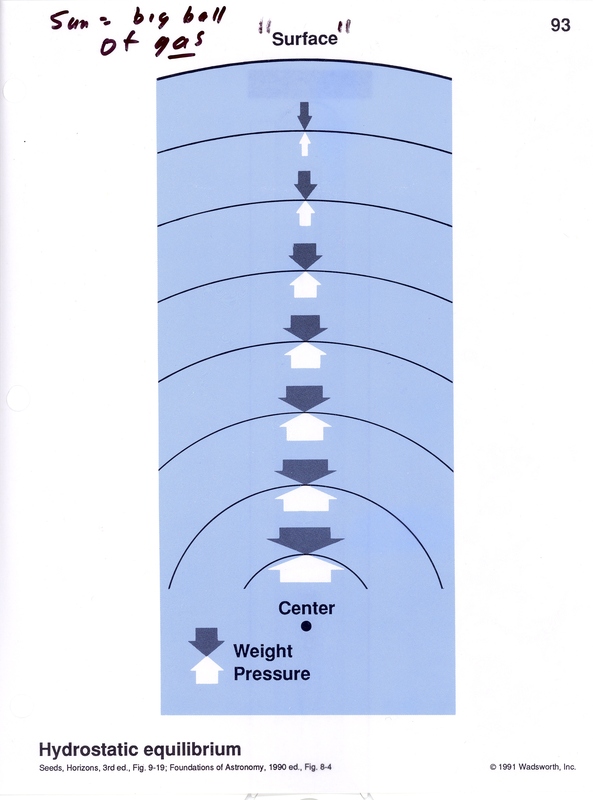 As shown in the 2nd image, the two forces, gravity (or weight) and pressure are balanced - one pushes out from the center, the other pushes in. This balance can continue for a long time. 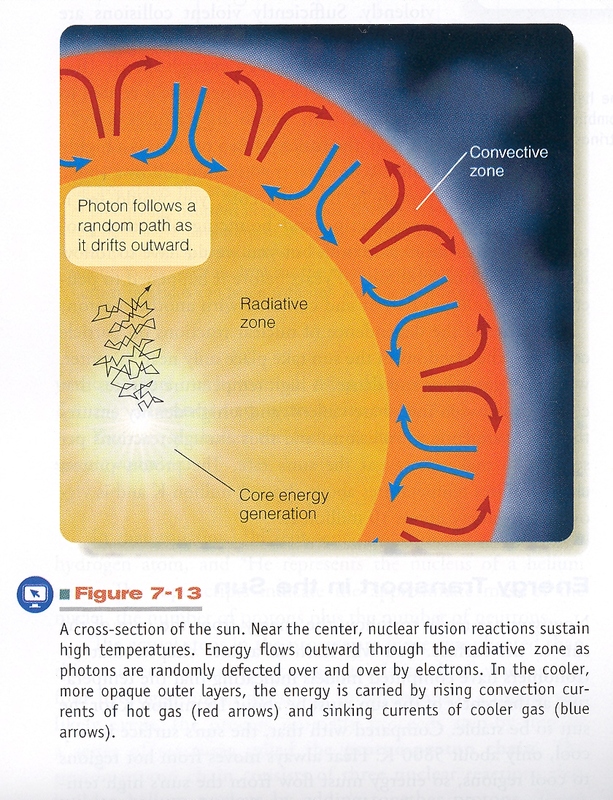 In the case of the Sun, the forces can remain in balance for about 10 billion years. 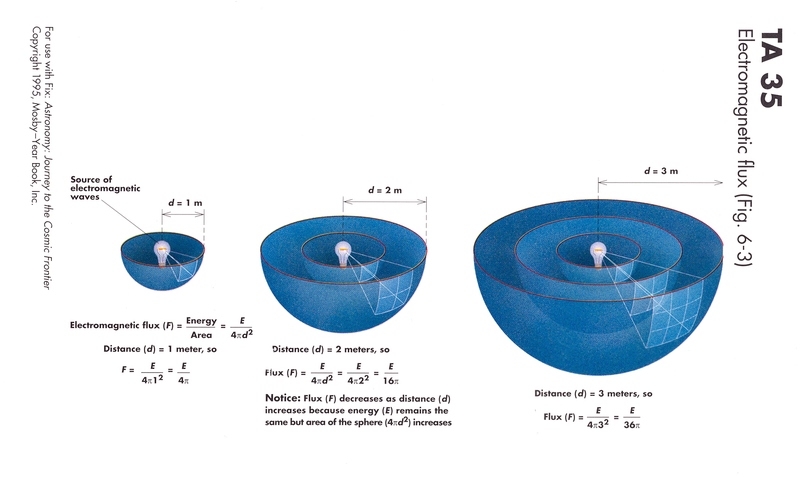 Inverse square law. The flux (brightness we see or measure) of radiation decreases as the inverse square of the distance from the source of light or other EMR. For the case of a star, we can measure the flux with a telescope and some sort of device for detecting EMR (such as a CCD). If we can measure the distance to the star (say with parallax) we can use the distance and flux to calculate the luminosity, or total power output, of the star. In common language, you can say we find the "wattage" or the "horsepower" of the star. For every source of light, from stars to automobile headlights, there are 3 important quantities: (1) true power output or luminosity (measured in Watts) (2) distance (3) apparant brightness or flux - in everyday words , how bright the object looks. These 3 quantities are related mathematically by the inverse square law. In common words "lights look dimmer as they get farther away". IF WE CAN MEASURE ANY 2 OF THESE 3 THINGS WE CAN CALCULATE THE 3RD. Most importantly, if we measure the apparent brightness to a star (using a telescope and CCD, for instance) and measure the distance to the star (say using parallax) we can calculate the true power or Luminosity of the star. Orion star colors Our old buddy Orion. (What? You still haven't gone out and looked at Orion! JUST DO IT.) 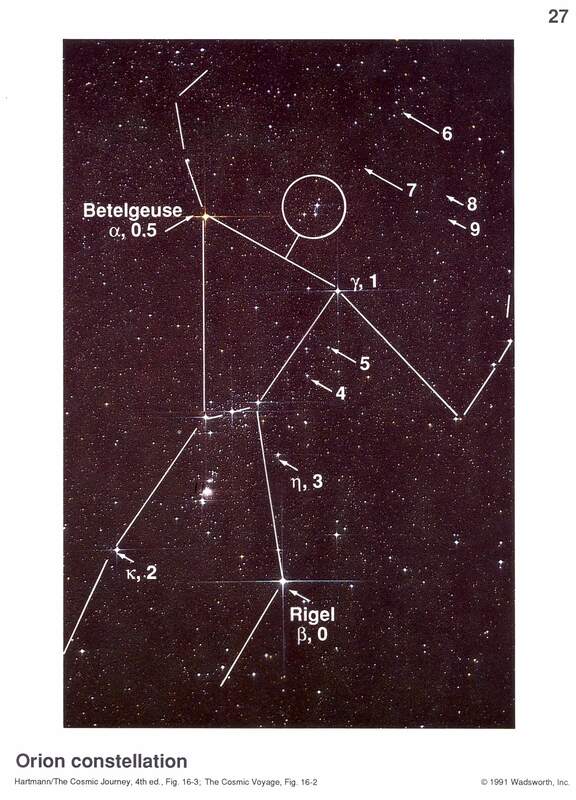 The "left" sholder star (Betelgeuse) looks reddish because it has a lower temeperature than tha Sun, about 3500 K. It has a spectral type of M. The "righ" foot or knee star, Rigel, looks whiteish or blueish. This star has a temperature about 2 times that of the Sun. It has a spectral type of B. Spectrum and graph of spectrum of a star The top colored band shows the visible light portion of the spectrum of a star. The star exhibits an overall blackbody spectrum, but has some absorption lines (wavelengths where light is missing). 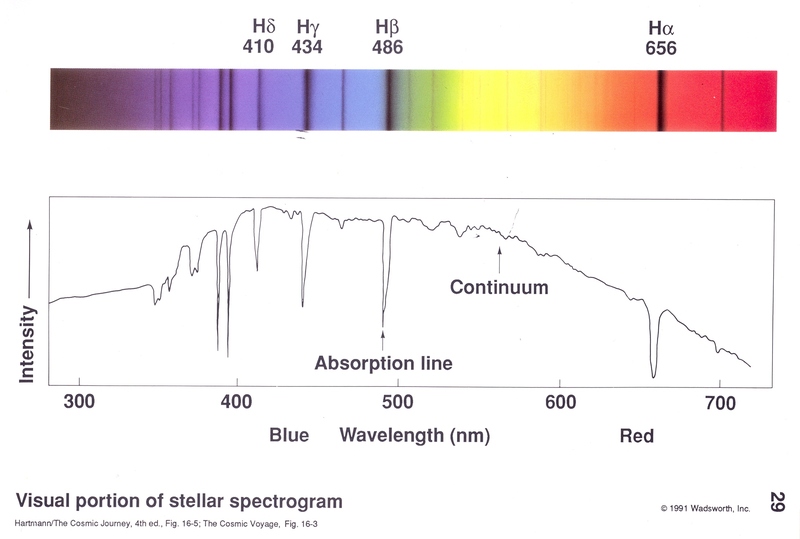 You can think of the absorption lines as light absorbed by the outer layers of the star. The bottom graph is also called a spectrum. It is a plot of amount of light (labeled "intensity") on the y axis aof the graph, and the wavelength or color of the light on the x axis. Note how the darker absorption lines in the top band correspond to deeper "dips" in the bottom graph. The pattern of spectral lines in different stars are given letters- such as O star, B star, etc. 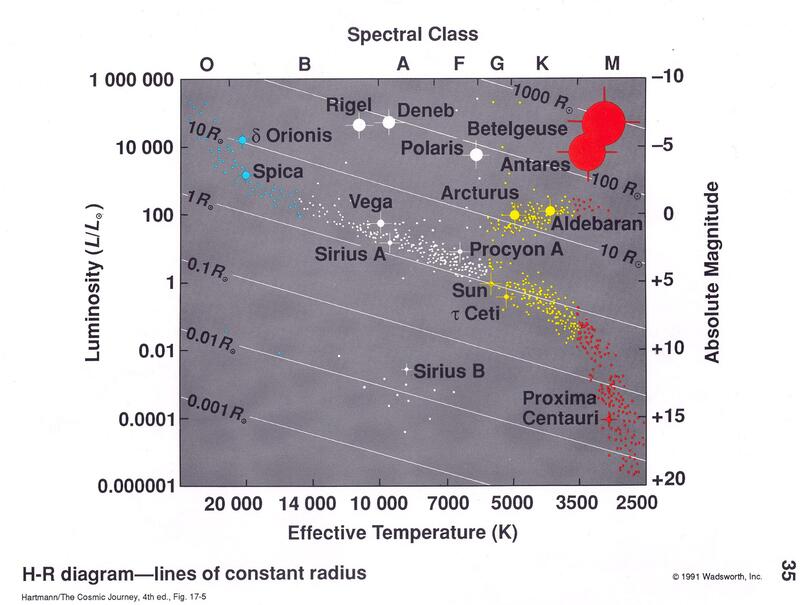 The different spectral patterns are due to different temperatures of the stars. The spectral sequence, arranged from hot to cold, is OBAFGKM. O are the hottest stars, M the coolest. To remember this sequence, just remember "Oh Be A Fine Girl (Guy), Kiss Me". The temeperature of a star can be found from the overall shape of the spectrum of light emitted (the stars color) and also from the pattern of absorption lines (the spectral class). Once we know the temperature (mesured from color or spectral class) and luminosity (power) of many stars we can plot the temperature vs.luminosity in this diagram. This is a Hertzsprung- Russell or HR diagram. THIS IS THE MOST IMPORTANT DIAGRAM IN THE STUDY OF STARS. This diagram helps us to organize and understand the different types of stars. Note that the temperature scale appears to run "backwards"- higher temperatures are on the left. Also shown are lines of constant star size (radius, expressed in terms of Suns radius). These slope upward (to increasing luminosity) with increasing temperature. If you compare two stars of the same size, the hotter one will be more luminous, as each square meter of the hotter star's surface will emit more EMR than for the cooler star.